Chris Lake at Econsultancy has created this great image outlining the definitive guide to content marketing. 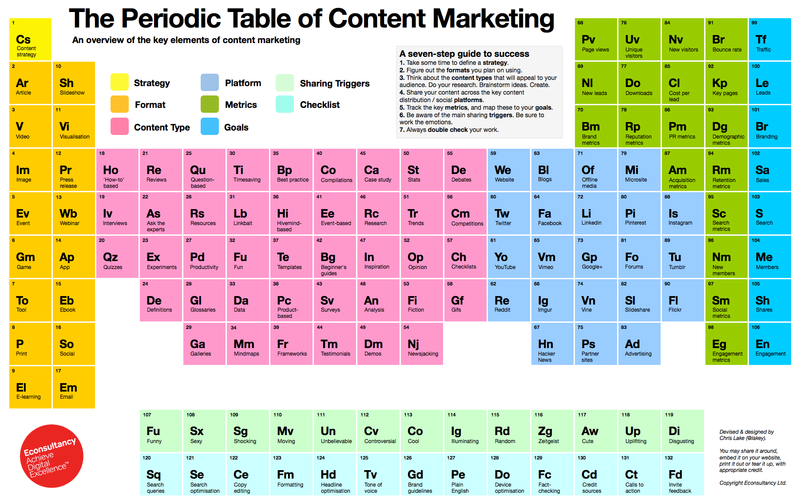 Called The Periodic Table of Content Marketing, the infographic covers everything your team needs to know for developing a solid content strategy, including format, platform, sharing triggers, and goals. Think about the content types that will appeal to your audience. Do your research. Brainstorm ideas. Create. Give it a look and definitely save it for future reference. This is a useful tool for marketers to have around when they’re planning out content strategy.